When Anthony Armstrong caught 44 passes for 871 yards with the Washington Redskins in 2010, it looked like the Miami Dolphins had missed out on a gem. After all, Armstrong spent all of 2008 on the Dolphins' practice squad before being waived the following year. The Dolphins got a second chance to feel Armstrong's impact when they claimed the 29-year-old off waivers this September. However, Armstrong was unable to make much of an impact in his second stint in Miami, catching just three passes in five games before his release on Tuesday. It's a disappointing end to Armstrong's brief second go-round with the Dolphins, as he was expected to at least fill a much-needed role as a situational deep threat. That being said, the Dolphins are sitting fairly comfortably at 4-3, despite a rookie quarterback at the helm for nearly the entire season. Ryan Tannehill, whose status for Week 9 remains uncertain with a left knee bone bruise and deep thigh bruise, has shown impressive chemistry with underrated receiver Brian Hartline and always-reliable slot man Davone Bess. I also wouldn't expect a quarterback addition to the active roster regardless of the severity of Tannehill's injury, as the Dolphins have been dressing just two of their three all season and a Tannehill absence would just mean Pat Devlin dressing for the game behind Matt Moore. More likely, the Dolphins will sign someone at another position where guys are banged up right now, such as the defensive line, linebacker corps or secondary. Or, they'll add another body to Darren Rizzi's shining special teams unit. Stay tuned Wednesday as I'll have coverage of the Dolphins' corresponding move. With the ALCS over, I now have Sundays free and thus will continue doing live chats during Dolphins games! Join me this afternoon starting at 12:30pm ET for a live chat during today's game against the New York Jets! Entering a week of practice following their bye, the Miami Dolphins made some minor changes to the practice squad by releasing linebacker Joe Holland and signing H-back Dominique Jones. Jones joins the Dolphins' practice squad after spending training camp and the beginning of the regular season with the Indianapolis Colts, which was preceded by stints in several minor football leagues. Holland was signed to the practice squad last week (which I was unable to cover thanks to my day job covering the ALCS for TBS). 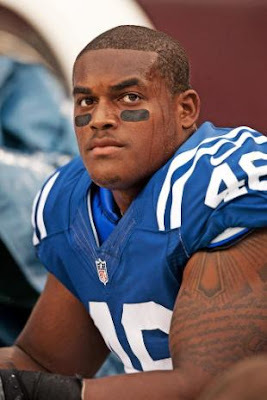 He was an undrafted rookie out of Purdue that had previously spent time with the San Francisco 49ers. A San Diego, Calif. native, Jones played college football at Division II Shepherd University, where he earned second-team all-conference and third-team All-American honors as a senior with 34 receptions, 403 yards and nine touchdowns. After going undrafted in 2011, Jones signed and played or the Sacramento Mountain Lions of the United Football League. In 2012, he led the Indoor Football League's Reading Express with 39 receptions for 349 yards and seven touchdowns before signing with the Indianapolis Colts on May 1. Jones caught three passes for 66 yards in the preseason, including an impressive, tackle-breaking 42-yard score you can see here. He made the team out of training camp, catching one pass for eight yards in his NFL debut and playing in the team's first four games before being waived on Oct. 8. 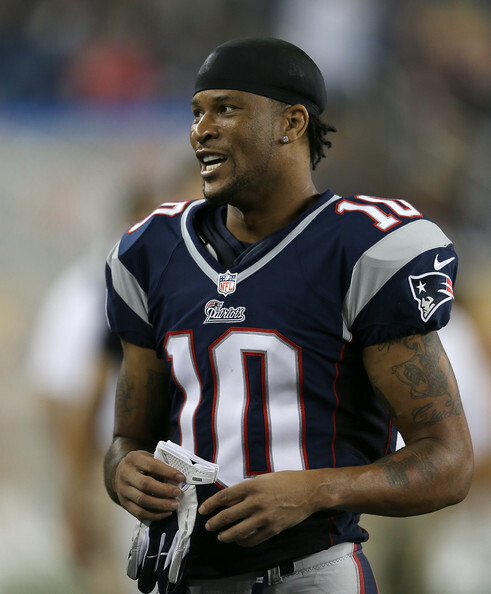 He spent another week on the team's practice squad before being released. According to Pro Football Focus, Jones played 33 offensive snaps for the Colts over his four games. He also played special teams during two of those games, recording zero tackles while being penalized for a fasemask in Week 3 against the Jaguars. It's still unclear what position Jones will play in Miami, as he played tight end in college and in the UFL and IFL, but was listed as a fullback with the Colts. It's not uncommon to see college tight ends lacking elite athleticism move to more of a fullback/H-back role at the pro level. The 6-foot-3, 255-pound Jones obviously does boast some receiving skills and it's fairly impressive he was able to make the Colts' roster out of camp and even see some action on offense given how off the radar he was when he went undrafted. The Dolphins have been rotating their practice squad players quite a bit over the last month and there is no guarantee Jones makes it beyond this week. The Miami Dolphins entered Wednesday with two open roster spots, having released three the day prior while signing only one in wide receiver Jabar Gaffney. With cornerbacks Nolan Carroll and Richard Marshall missing practice time with injuries this week, the Dolphins chose to beef up their secondary depth by filling one of those spots with practice squad cornerback De'Andre Presley. The Dolphins also signed cornerback Julian Posey to the practice squad to replace Presley while adding yet another healthy body to the position with Carroll and Marshall hurt. Finally, linebacker Mike Rivera cleared waivers and reverted to injured reserve Wednesday after being waived/injured the day before. Expect Rivera to be released outright in the near future. The Dolphins currently have 52 players on their active roster, with one open spot remaining. 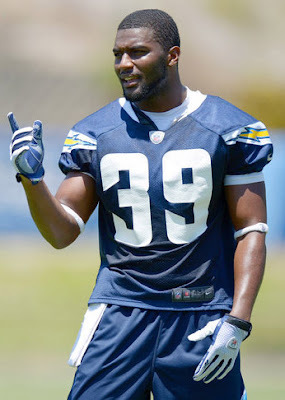 Presley went undrafted in the 2012 NFL Draft and signed with the San Diego Chargers, where he fully converted to defensive back. Despite racking up 13 tackles, an interception and two pass deflections in the preseason, Presley was waived during final cuts and signed to the Dolphins' initial practice squad. As he has done in practice since joining the Dolphins, Presley will don No. 21 if he is active this Sunday against the Cincinnati Bengals. The number was previously worn by the departed Vontae Davis. Posey played college football at Ohio University, where he started at cornerback for the Bobcats as a senior in 2010 and amassed 46 tackles, 12 pass deflections and an interception. He went undrafted in 2011 and spent much of his rookie season on the practice squad of the New York Jets. After re-signing with the Jets in the 2012 offseason, Posey appeared in all four preseason games (starting one) and totaled 12 tackles. He was waived during final cuts and subsequently worked out for the Cincinnati Bengals, though he was not signed. At this point, it's impossible to tell if Presley has shown any real promise in practice or if he is needed simply as a healthy and familiar body at the position. Nolan Carroll (Achilles') and Richard Marshall (back) are both iffy for Sunday's game, so Presley could be pressed into action sooner than expected. Presley is certainly a tremendous athlete and is a bit of an intriguing prospect, but odds are he isn't ready for a role on defense yet and will probably work primarily on special teams if he dresses this week. Cornerback R. J. Stanford, who was claimed off waivers from the Panthers after final cuts, would be the first man up to replace either Carroll or Marshall. Stanford, who was a seventh-round pick by Carolina in 2010 and has played in 12 games last season, has not yet seen a defensive snap in a game with the Dolphins and has just two special teams tackles to his credit. As for Posey, it's safe to say that he's merely here because the Dolphins need practice depth, and his status with the team is day-to-day unless he really shines in that capacity. Another week, another heartbreaking loss for the Miami Dolphins. Just like Week's 3's game against the Jets, Week 4's matchup with Arizona featured a Dolphins team that outplayed its opponent only to fall in overtime. It's crazy to think that in a game where Ryan Tannehill set a franchise rookie record with 431 passing yards, Brian Hartline broke Chris Chambers' single-game mark with 253 receiving yards, and Cameron Wake set a personal best with four sacks, the Dolphins ended up losing. While the Dolphins could easily be 3-1 with just a few less turnovers and some timely "finishing" of games, they sit at 1-3 and at the bottom of the AFC East a quarter into the season. The Dolphins will remain on the road in Week 5 as they travel to Cincinnati to face the 3-1 Bengals. Until then, here are my thought on their tough Week 4 loss to the Cardinals. It's hard to be anything but ecstatic with the way Ryan Tannehill played yesterday. He finally got a chance to air it out and he certainly didn't disappoint. He had a few bad throws, including one that should have been intercepted but it the ground in the defender's hands, but his actual interceptions were really the result of a receiver slipping and some blitz-pickup issues. I absolutely loved his command of the offense yesterday and although the team is 1-3, this is exactly the kind of optimism I wanted to get out of his play this season. Surprisingly, the Dolphins' running game didn't get going as much as it has the past few weeks, taking a backseat to the passing attack. The good news is that Reggie Bush looked solid and came out of the game healthy, so I'd expect him to resume a bigger load going forward. I thought Jorvorskie Lane had a great game all-around, not only with his touchdown but also as a lead blocker. Quite a find for the Dolphins. 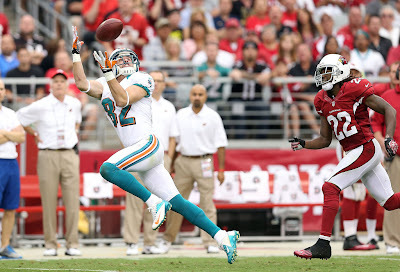 I've always been a big Brian Hartline fan, but a performance like this is still stunning. Hartline did a great job yesterday and seems to have an incredible rapport with Tannehill despite missing the whole preseason. 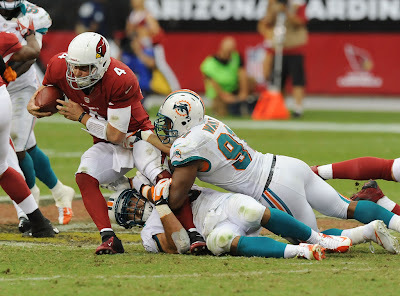 He and Tannehill did a great job taking advantage of the weaker points of Arizona's secondary. Although his slip and fall that resulted in an interception was unfortunate, that kind of thing happens and it doesn't take away from the good things he did. Then you throw in the always-reliable Davone Bess, and it's clear to see why Tannehill targets these two so often. On the other end of the spectrum, Legedu Naanee has gone from a non-contributing ghost to a game-killer. He spent the first three games playing sparingly on offense and not catching a pass, only to hook up with Tannehill on a deep ball late in the game yesterday and fumble it with no contact. I know the guy is guaranteed his $700,000 salary, but I can't stand the fact that he's still in Miami and they might as well move on now. The offensive line continues to be solid, although it needs to handle blitzers well. I also thought Jake Long had a pretty rough first half and he's still not playing at the elite level to which we've become accustomed. I would hope that this is because he may not be 100 percent, but it's certainly something to watch going forward. I continue to be very pleased with how Mike Pouncey is playing and he looks more and more like a great center everyday. As one would expect given the Dolphins' quality defensive line and the Cardinals' offensive line woes, Miami dominated this game upfront. Cameron Wake continued to get held on a regular basis, but that didn't stop him from getting four sacks after being shut out the past three games. The team overall did a very nice job stuffing the run and getting consistent pressure on Kevin Kolb. The linebackers had a pretty solid game as well, and had a fairly easy time given the lack of Arizona's running game and receiving threats in the middle of the field. Karlos Dansby needs to shut his mouth, but he at least made some plays in this one and actually got one of the Dolphins' many sacks. It's hard to find much to complain about in Sean Smith's performance this week. He did allow the game-tying touchdown late, but he was matched up on Larry Fitzgerald all day and basically shut him down from any big plays. Not only that, but he made two very nice plays on interceptions and tackled well. I can't say I was nearly as happy with how Richard Marshall and Nolan Carroll played, especially considering the constant pressure Kolb had to deal with. Another missed kick for Dan Carpenter has fans up in arms, but I'm not ready to move on. We're still looking at a small sample here and Carpenter has been reliable for years, so I see no reason to let him go with his salary guaranteed for the season. Now if he continues to struggle, I certainly look to go younger and cheaper next year, but moving on yet is a little quick. Brandon Fields had another strong day, aided by Patrick Peterson consistently doing stupid things like bobbling punts and fair-catching the ball at the three-yard line. It's unfortunate to think how easily the Dolphins could be 3-1 or 2-2 right now, but sitting where we are was not unexpected given the Dolphins' holes. 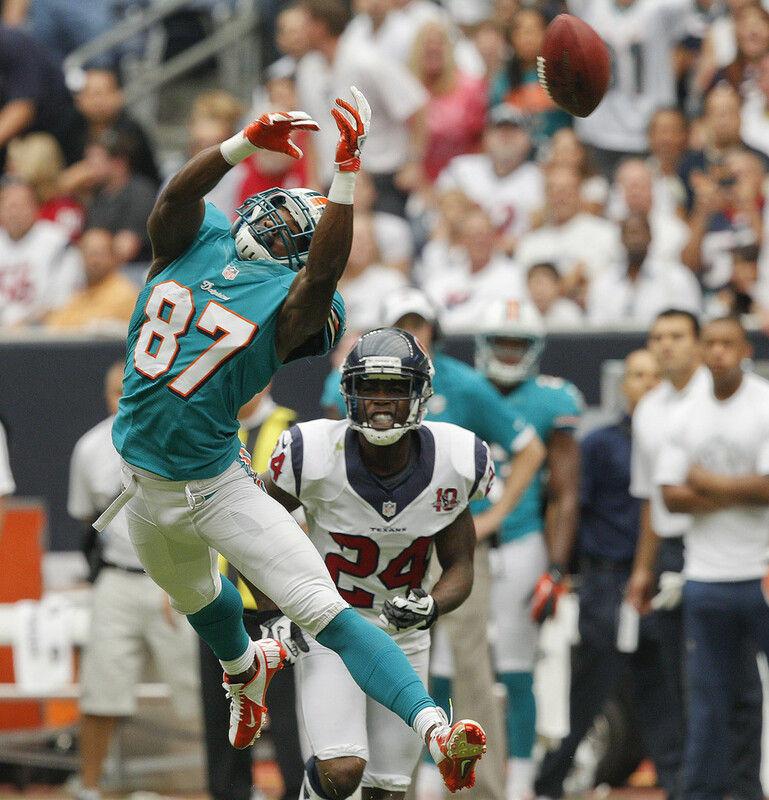 At the very least, it is nice to see guys like Ryan Tannehill, Brian Hartline, Mike Pouncey, Cameron Wake and Sean Smith playing well, as that's really all we could hope for going into the 2012 season. The Dolphins did a lot of good things in this game, including but not limited to a strong passing attack, a good pass rush and sound tackling, which are all things the team had been lacking in previous weeks. There are still roster holes and there is still work to be done, however. The Dolphins have to avoid untimely turnovers, they have to get more consistent in all facets and head coach Joe Philbin absolutely has to avoid crucial coaching mistakes.